Targets PowerPoint templates, backgrounds Presentation slides, PPT Themes and Graphics. 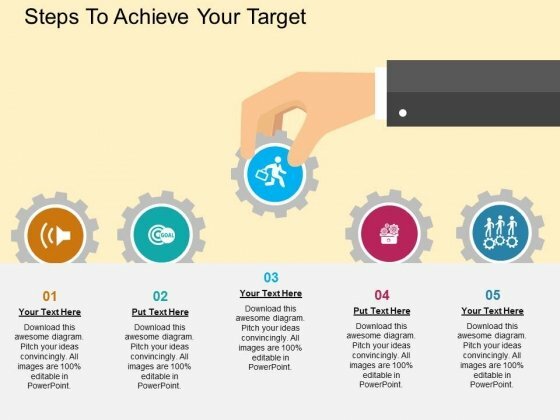 Achieve your business goals with our Targets PowerPoint templates and themes. You can create some wonderful PPT’s on topics such as success, marketing, advertising, arrows and many others. 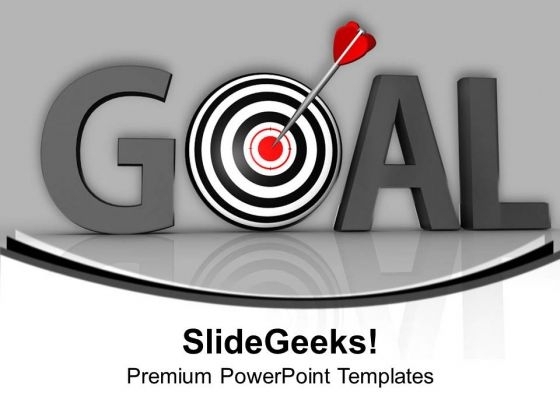 We also have a selection of free Targets PowerPoint templates in our free section. Are you searching for an archery target template, shooting target template or simply a dartboard to show the target customers or your business goals? You came to the right place. SlideGeeks has professionally designed, fully editable Target PowerPoint templates and target diagrams to help you showcase your sales targets for the coming financial year or the market profile of the audience you wish to target for your next marketing strategy. Hitting the bullseye with dart arrows is an interesting game that a sales or marketing professional has to play in real life in corporate world too. Use this association to bring out the competition, focus and determination of your efforts with our target PowerPoint templates today. This PowerPoint template has been designed with graphics of megaphone with text bubble. Download this slide for business communication and mission related topics. You may also use this template to depict business agenda. Counsel them on the need for ethics. 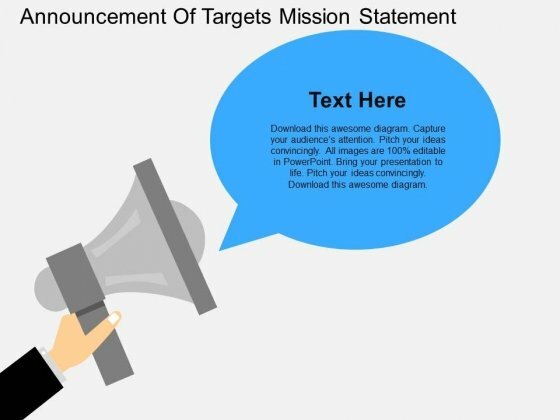 Our Announcement Of Targets Mission Statement Powerpoint Template can be very convincing. This PowerPoint template is useful for making presentations on business goals and strategy formation. This PPT background has a design of business team discussing team targets. This PPT slide is suitable for topics like corporate strategic planning. Take the plunge with our Business Team Discussing Targets Powerpoint Slides. Success will surely ensue. Our PowerPoint template has been designed with graphics of target board. This business diagram may be used to display target market strategies for successful business. Grab centre stage with this slide and attract the attention of your audience. 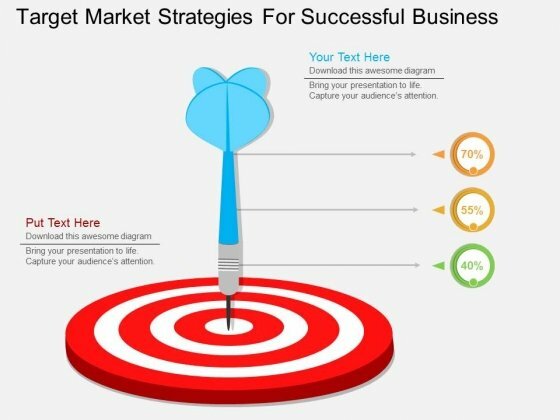 Take the plunge with our Target Market Strategies For Successful Business Powerpoint Template. Success will surely ensue. Adjust the above diagram into your presentations to visually support your content. 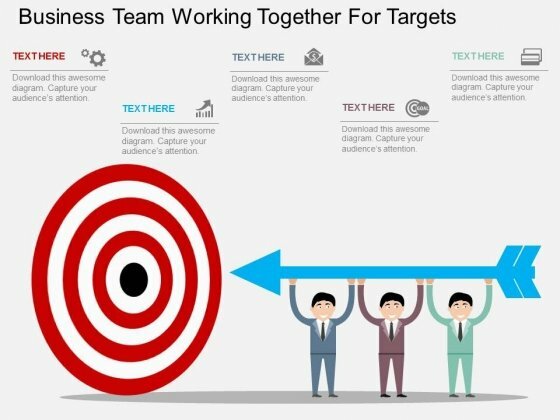 This PPT slide has been professionally designed with graphics of business team working together for targets. This template offers an excellent background to display teamwork and management. 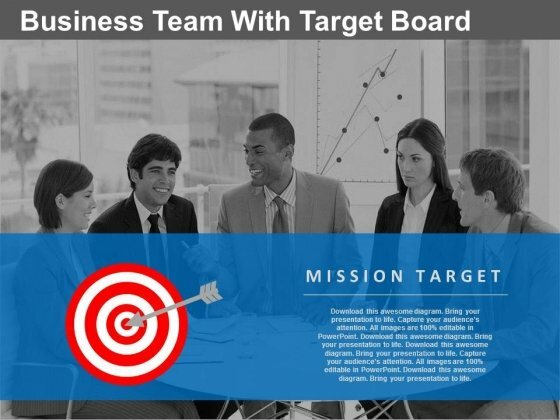 Take the plunge with our Business Team Working Together For Targets Powerpoint Template. Success will surely ensue. In this fast moving world, every organization and business is working hard to achieve their goals. What better way could be to portray to your clients and customer that your company is working at its best and in an organized manner to deliver the unexcelled. This will help you gain the trust of your investors, clients and employees. All organizations and companies are judged on their performance and this slide is all about success, good performance and satisfaction. You can also use this template to lay emphasis on teamwork and the importance of coordination between different departments for achieving the set of goals. The arrow being carried by three happy men denotes progress being carried out by the teams in an effort to attain the highest standard of satisfaction from their work. 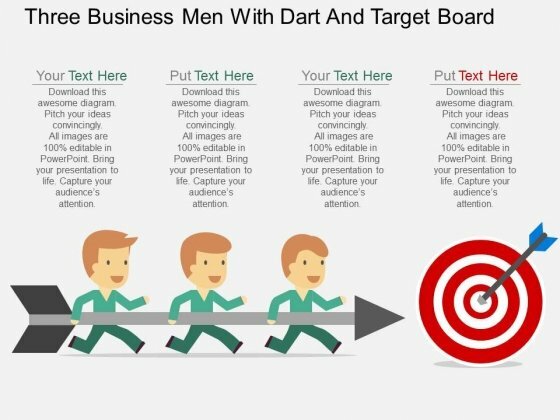 Take the plunge with our Three Business Men With Dart And Target Board PowerPoint Template. Success will surely ensue. Perfect template to flaunt your achievements. This PowerPoint template is an image of thermometer showing that how good your company’s performance is and can depict that you have successfully reached goal. From time to time, how you have completed your targets and reached at number one position. A perfect slide to show your goals achieved. Or it can also be used to show your business goals. So make an excellent choice and choose this simply amazing slide and make your PPT presentation look wonderful. 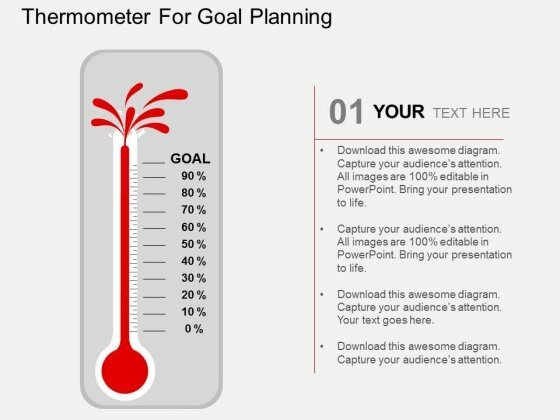 Take the plunge with our Thermometer For Goal Planning PowerPoint Templates. Success will surely ensue. Looking for the right business theme for next sales or marketing presentation? 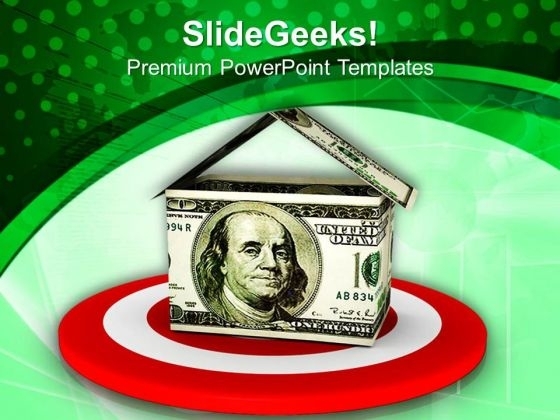 SlideGeeks has hundreds of professionally designed target PowerPoint themes and slide backgrounds to create an awesome sales presentation that will leave no doubt in your target audience mind. Whether it is target pins, darts hitting the bullseye, multiple layers of targets on a dartboard, or 3D man hitting darts, we have all these and more target themes to add professional value to your presentation. Draw on the experience of our To Buy A Home Spend Money PowerPoint Templates PPT Backgrounds For Slides. They imbibe from past masters. Drink the nectar of our money PowerPoint Templates. Give your thoughts a long life. Draw it out on our finance PowerPoint Templates. Provide inspiration to your colleagues. Do not let fatalism takeover. Chart your destiny with our To Buy A Home Spend Money PowerPoint Templates Ppt Backgrounds For Slides 0613.